Continuing the editing and annotation of folksongs collected by Sam Eskin (1898-1974) begun in volume 38 ( Spring/Fall 2012) of Midwestern Folklore, I present here in Part II [Midwestern Folklore, volume 39, Spring/Fall 2013] a selection of songs with themes of love, violence, and eroticism that filled Eskin’s three notebooks of field-collected material. He put songs that he considered bawdy into a separate notebook and labeled it with a delta symbol used by the Library of Congress to represent risque items. 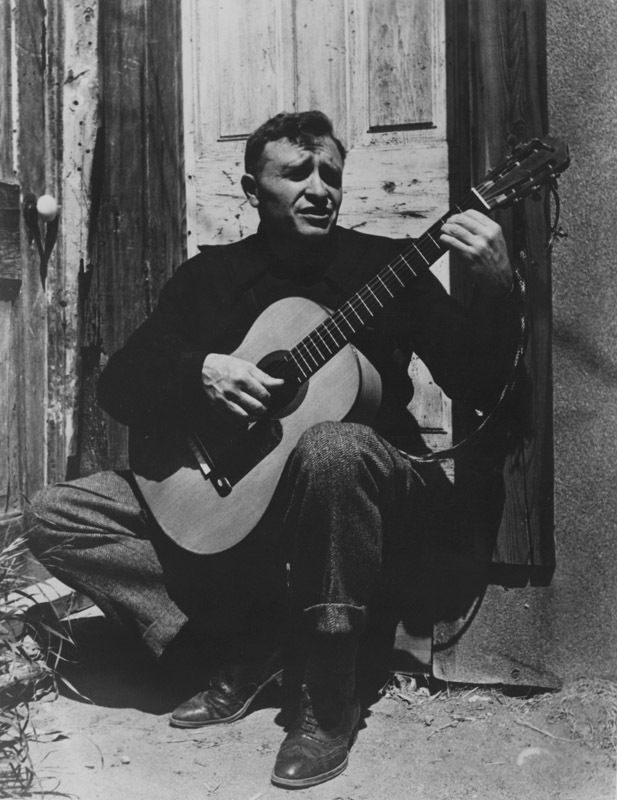 Eskin collected most of these songs immediately after World War II. He quizzed returning soldiers and sailors about their song repertoire and transcribed a number of songs that show interaction with British troops and their bawdy ballad tradition. Concentrating on songs, he filed recitations and folk rhymes, many of them considered obscene at the time, in a separate file. Many of the bawdy songs are still in circulation in the twenty-first century, giving credence to his mission in his Folksong Alive project to show folk song to be a living tradition. Indeed, he predicted that the bawdy song tradition was likely to enjoy new life in college dormitories and fraternity houses as many of the veterans made the move to campus life. 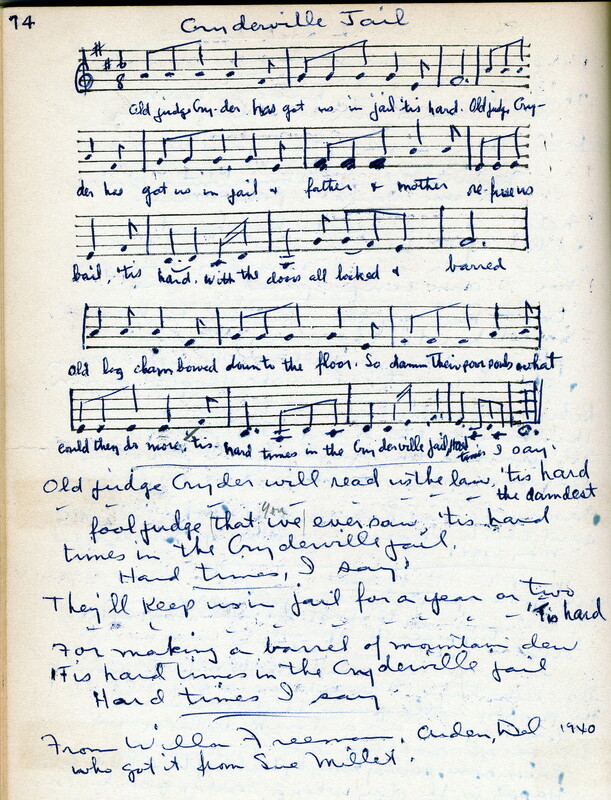 As my annotation shows, several of the songs had already been documented in college life before the 1940s when Eskin was doing his recording. Others such as “Bolo’d” and “Shoe and Her Ankle Too” have not been widely documented and have historical significance, especially since much of this material has been omitted, suppressed, or bowdlerized in previous collections (an example is a ribald version of “Our Goodman,” number 69). More so than for the notebooks filled with songs of love and violence, the delta notebook included Eskin’s recollections of texts from his pre-War days in the Merchant Marine, railroading, and ranching. Eskin’s repertoire drew the attention of the leading scholar of erotica, G. Legman, who included in Roll Me in Your Arms (Randolph 1992, 332) some of the songs Eskin performed for him on a visit to his home in France during the summer of 1955. For Eskin, this folksong corpus came from a man’s world. The songs of love and violence were frequently the domain of women. He found many of his songs of love and violence in the labor camps of the West left over from the New Deal. Among the performers from whom he recorded the most songs are Indiana -born Myrtle Downing (born Street) and “Uncle” Nate Dye, who apparently had experience working in lumber camps where he learned much of his repertoire. Neither one recorded commercially or went on the festival stage, but they had active roles in the labor camp community of perpetuating a ballad-singing tradition. 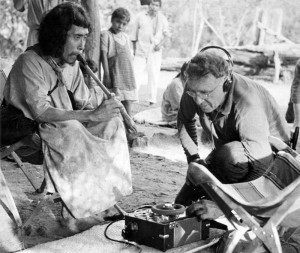 Eskin’s recordings demonstrate that these tradition-bearers did not memorize set pieces as much as they remembered plots and extended their performances with floating verses. In contrast, Moon Mullican is an example of someone that Eskin recorded who had commercial success as a recording and performing artist, but Eskin documented folk songs in his repertoire such as “Girl I Left Behind Me” that had not made it into his discography. Mullican offered Eskin songs he fondly recalled learning from his parents in his Texas youth. Eskin found Laura Bradshaw (born Petty) near Chapel Hill, North Carolina, and he documented her rich ballad repertoire. There was a sense in his recordings, though, that her performance of ballads of British origin represented a passing tradition. He took a special interest, however, in her songs such as “Coal Black Hair” (no. 39 in this volume) that he thought had a regional vitality if not a national circulation or British origin. More than treating songs as specimens to be placed under glass, Eskin commented on the relation of singers to their songs. Myrtle Downing’s performance of “Forsaken” (no. 42 in this volume) affected him because of her history of being abandoned by lovers. He related to Harry “Haywire Mac” McClintock’s life of adventure and the songs he picked up along the way because he had similar experiences out at sea and on the rails. McClintock had recorded commercially but Eskin had an opportunity to get songs such as “Bolo’d” that would not be released. Some songs attracted Eskin because of the stories behind them. “Pa Rattin” (no. 51 in this volume) for example, has violent imagery of a family being slaughtered and Eskin wondered if this was a murder ballad based upon true events. The singer did not know if it was, and the family name of “Rattin” was not a familiar one. I present research here that suggests that the song is indeed connected to the murder of a family named “Wratten” in Indiana in 1893. 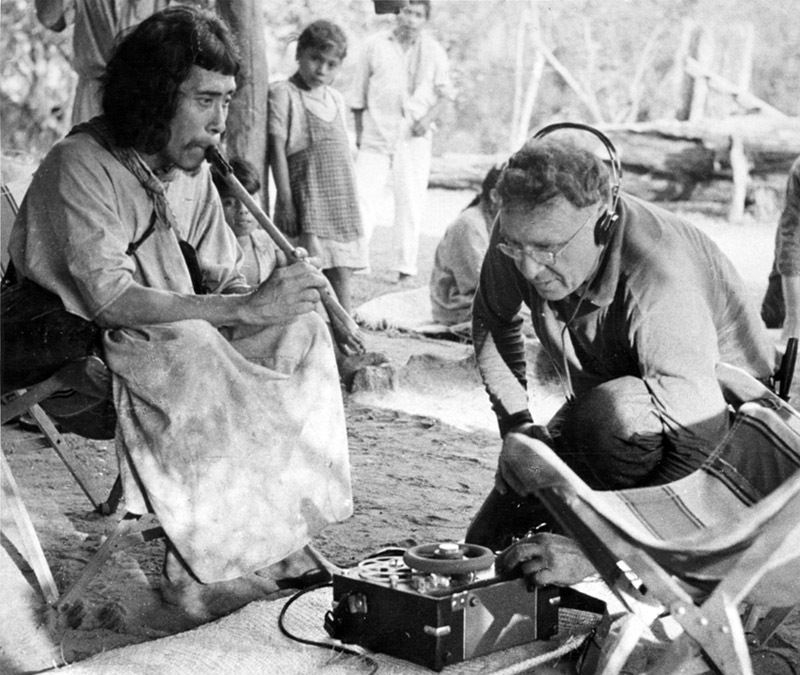 More research is needed on the emergence of the song after the horrific crime was committed but there is evidence of the song’s circulation in oral tradition through the twentieth century. “Buttermilk Hill” (no. 38 in this volume) is one that fascinated Eskin because it was performed as a song about the West but he noted a lineage dating back to an Irish provenance. 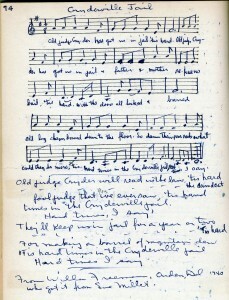 Eskin frequently made notes singers’ sources for songs, and used the titles of songs they provided. In the case of “Grandpa Larson’s Song” (no. 45 in this volume), a song that I have identified as “When I Was Young and In My Prime,” retains the name of the source the singer recalled and a sign of the family folklore surrounding the song. In many cases, I filled in the information based upon historical and folkloristic sources. “Our Baby Died” (no. 68 in this volume) might seem out of place among Eskin’s songs, but I have located it within the context of the “cruel joke” series circulating during the 1950s that brought up issues of child abuse and abortion through the veil of humor (see Dundes 1979; Sutton-Smith 1960). In other cases, I have offered possible symbolic meanings for references in the songs (e.g., “My Little Organ Grinder (Rio Rio),” no. 65 in this volume) and social historical information as context (e.g., the Filipino references in “Bolo’d,” no. 60 in this volume). As in the past volume, I indicate my corrections of, or questions about, his transcription of lyrics by placing text within brackets. The two volumes in which Eskin’s collection has been presented raises a methodological issue about the value of annotation in folkloristic practice. Although I recognize that some folklorists associate annotation with an older historic-geographic methodology, my view is that in modern folkloristics the annotation can open for view perspectives on matters of social process and traditionality of crucial importance in the analysis of the material with which folklorists work. In my annotations, I give conventional attention to origin and diffusion of traditions in addition to matters of variance in folk process. I also note indexing information where available to advance comparative studies of folk song. What I have added frequently is information about the interplay of this material with popular culture and interpretative comments on the performers’ motivations and the symbolic meanings of songs that help explain their function, persistence, and in many cases, disappearance. I have made a case prior to this project that annnotation is a distinctive folkloristic tool in need of continued development, especially to comparative cultural endeavors (Bronner 2006; Bronner 2011, 89-91; see also Oring 1989). The annotation also frequently has as its driving mission to provide insights into processes of oikotypification, hybridization, practice (i.e., the question of why people repeat themselves), social context, and structure (including symbolic and cognitive structures). The Eskin project has convinced me that much work still needs to be done with collections among folklorists that like Vance Randolph’s were once considered “unprintable” or like Eskin’s were not made publicly available. Not just a matter of adding texts to our corpus of folkloristic knowledge, their work in the field, once analyzed, contributes immensely to our understanding of the dynamics of tradition. Bronner, Simon J. 2006. “Folklorists.” In Encyclopedia of American Folklife, ed. Simon J. Bronner, 422-26. Armonk, NY: M. E. Sharpe. Bronner, Simon J. 2011. Explaining Traditions: Folk Behavior in Modern Culture. Lexington: University Press of Kentucky. Dundes, Alan. 1979. “The Dead Baby Joke Cycle.” Western Folklore 33: 145-57. Oring, Elliott. 1989. “Documenting Folklore: The Annotation.” In Folk Groups and Folklore Genres: A Reader, ed. Elliott Oring, 358-73. Logan: Utah State University Press. Randolph, Vance. 1992. Roll Me In Your Arms: “Unprintable” Ozark Folksongs and Folklore, Volume I–Folksongs and Music, ed. G. Legman. Fayetteville: University of Arkansas Press. Sutton-Smith, Brian. 1960. “‘Shut Up and Keep Digging’: The Cruel Joke Series.” Midwest Folklore 10: 11-22.